~In this refreshingly candid look at what it takes to live a life of faith, John Ortberg takes an honest look at the misgivings and uncertainties that often shake our beliefs as we navigate through the highs and lows of life. Reflecting on his own bouts with doubt and uncertainty, Ortberg shares with readers his discovery that, rather than being a contradiction in terms, doubt and faith may be very much a part of each other. He challenges readers to consider how doubt can motivate us to study and learn, how questioning expands our understanding, and how uncertainty can lead to trust. These challenges point us toward the relief of being totally honest. The right kind of doubt can be a gift?an action-generating truth that actually allows us to deepen our faith and intimacy with God. 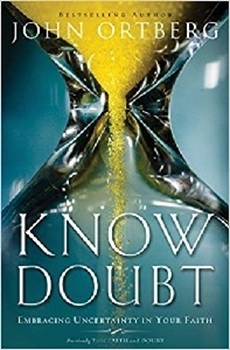 Written to challenge, comfort, and inspire readers, Know Doubt reveals uncertainty as a cause for celebration.